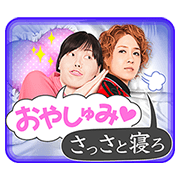 http://www.line-stickers.com/ – Shin Naniwa Kinyuudo Series Line Sticker | Shin Naniwa Kinyuudo, a popular manga series from magazine SPA!, is now on LINE! Fight your way through the hardships of life with these colorful characters! Copyright : © Yuji Aoki Production/FUSOSHA Publishing inc.